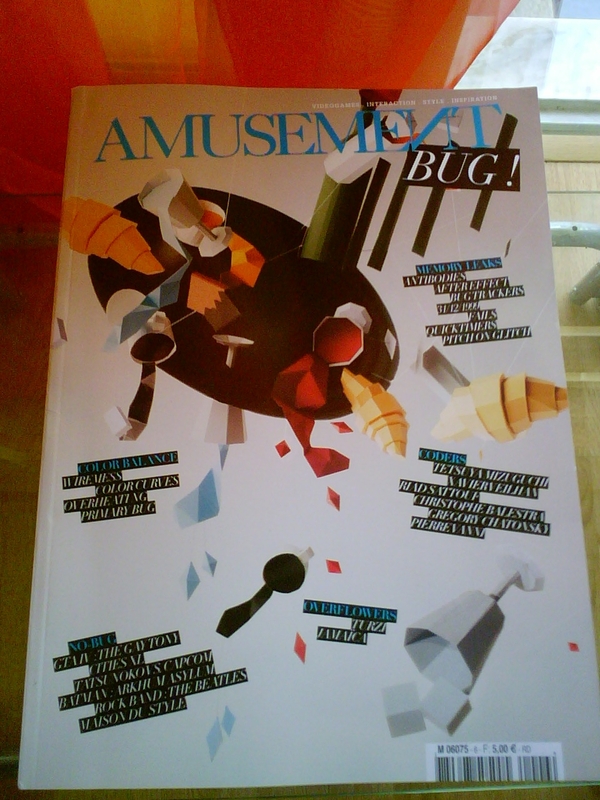 COREgaming, by dieubussy: Amusement magazine, issue 6: BUG! 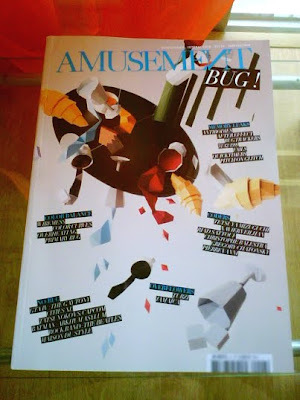 Amusement magazine, issue 6: BUG! There was a time, long before the arrival of the Internet, when videogame players celebrated the inclusion of game-related topics in the smallest of columns of everyday newspapers. 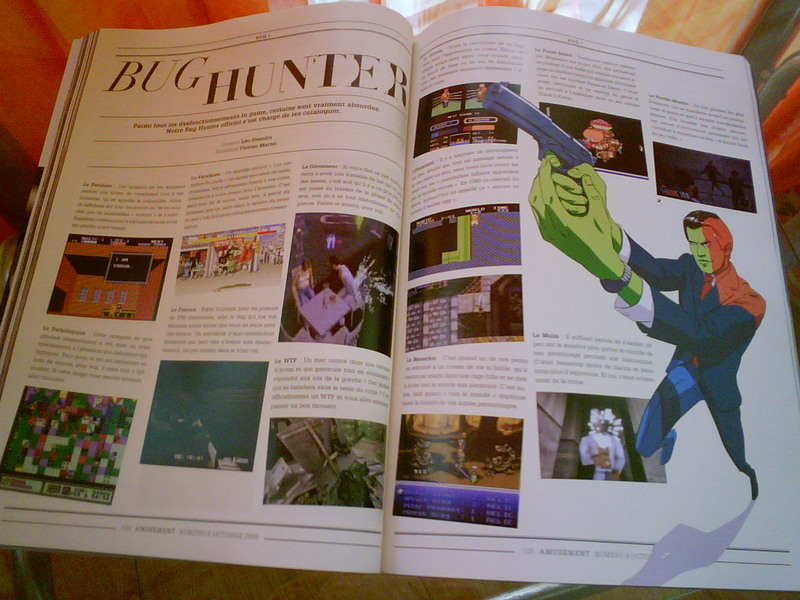 In time, the small footnotes became single and double-page features about fresh game releases, hints, pokes and cheats. 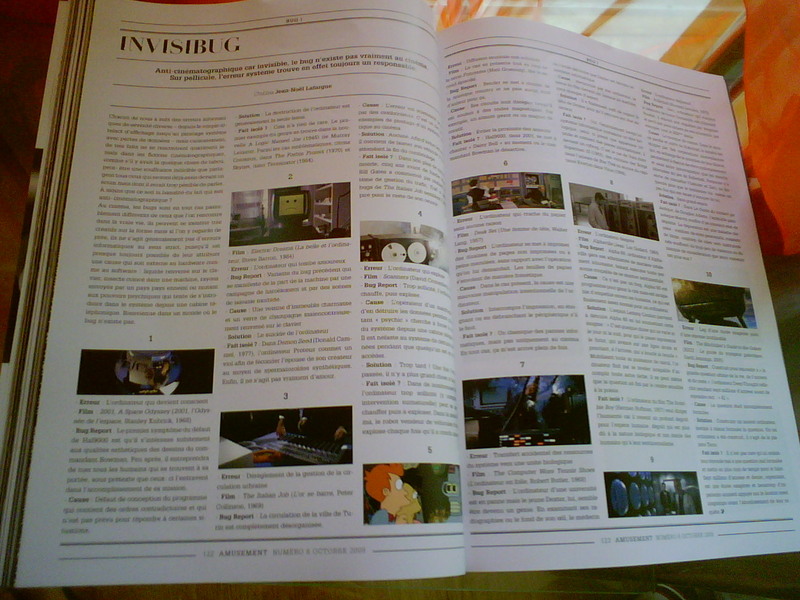 As a consequence of the sudden growth of the computer and console business, a few dedicated publications appeared in the United States of America, the epicenter of the videogame industry revolution; yet firstly in the United Kingdom. Countless magazines were edited during the 1980's and 90's throughout the globe; some of them vanished in a matter of months; others were successful for a short while; only a few kept alive until this day. 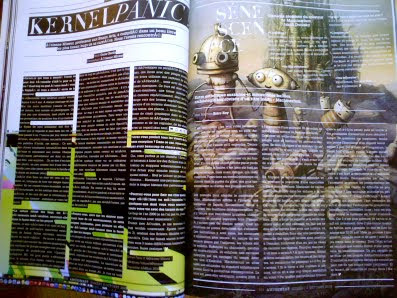 But just as the format of the printer paper slowly capitulated to the emerging HTML format, so did the videogame magazines become a secondary choice to game players who needn't wait for the end of the month to read the latest news, now updated every second in the windows of their internet browsers. In order to oppose the costless information supply of game sites, magazines were forced to improve and to become more exclusive than ever in order to survive. 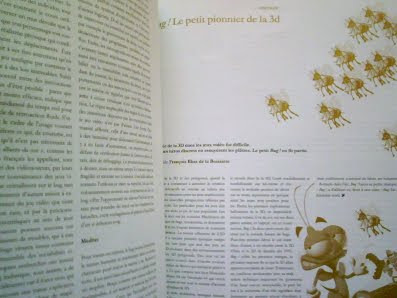 AMUSEMENT magazine, a fairly recent French trimestral publication, addresses some of the larger problems of the games journalism sphere, providing the sort of educated reading that is still light-years away from the common videogame website. A first look at any of the existing issues of AMUSEMENT is sure to cause shock and awe: apparently, even after a quick browsing through the pages, this magazine is hard to identify as being related to the subject of games. Its discerning design easily evokes the flair and elegance seen in the visual presentation of a Vogue or Vanity Fair magazines. There are no game previews, reviews or even news articles proper; each piece has an identity of its own. This radical perspective has made this magazine a new and inspiring reference in the treatment of videogame subjects, something which is clear not only in its daring imagery, but also in the selection of themes. The latest issue of the magazine, entitled BUG, is dedicated to concept of game program bug or glitch. Through different articles, the authors provide unique assessments on how these program errors have characterized videogames for long and will continue to do so in the future. The following are some of the highlights of this sixth edition (please click the images for larger views). 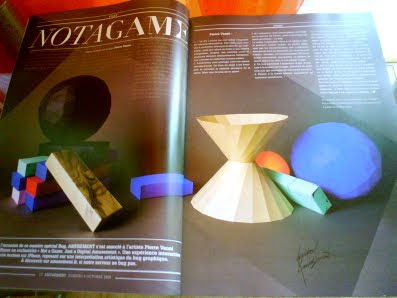 Not a Game, Just a Digital Amusement is a joint venture between the magazine and the artist Pierre Vanni on the subject of game bugs. Scheduled for release on the iPhone on the 25th of December, this non-game will make use of elemental volumes and shapes. Theplayer must use the touch screen to create visual motives which can only be interpreted at a distance in an exercise that relates to the true nature of digital images - the pixels -, very much like a new aged version of Plato's cavern. 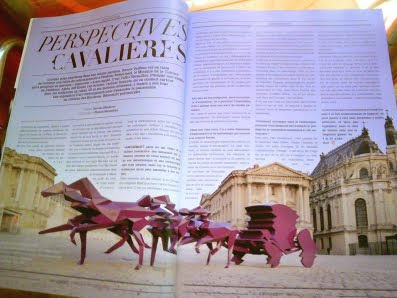 A fine example of this magazine's focus on subjects of interest to videogame players that are not directly related to the industry; this is an interview article with Xavier Veilhan, a vanguardist French artist whose recent work consists of presenting flat polygon sculptures near historical locations. 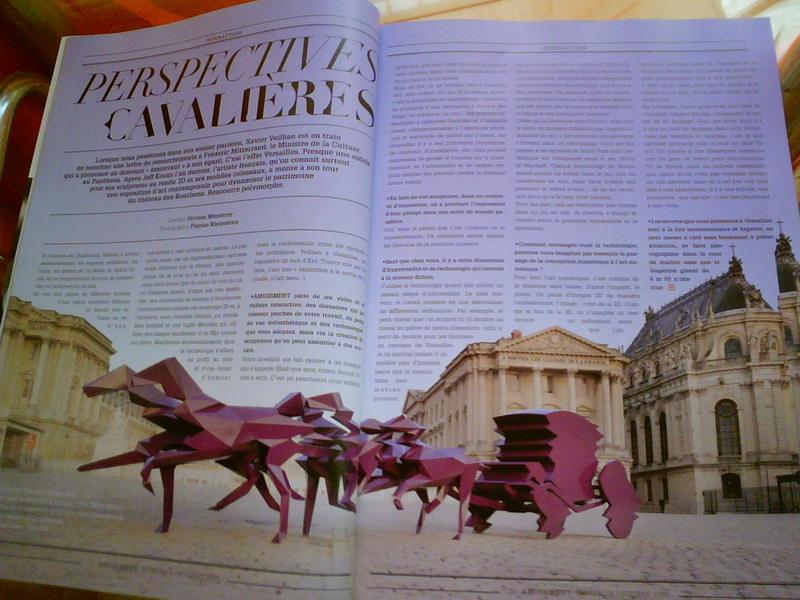 This contrast between old and new architectural and scultpural techniques is well illustrated by the image above, where a purple geometric chariot being pulled by horses is placed on front of the Versailles Palace. The celebrated creator of Konami's DANCE DANCE REVOLUTION, Naoki, is briefly enquired about his vision of the music games industry where his title played a central role in the last years. 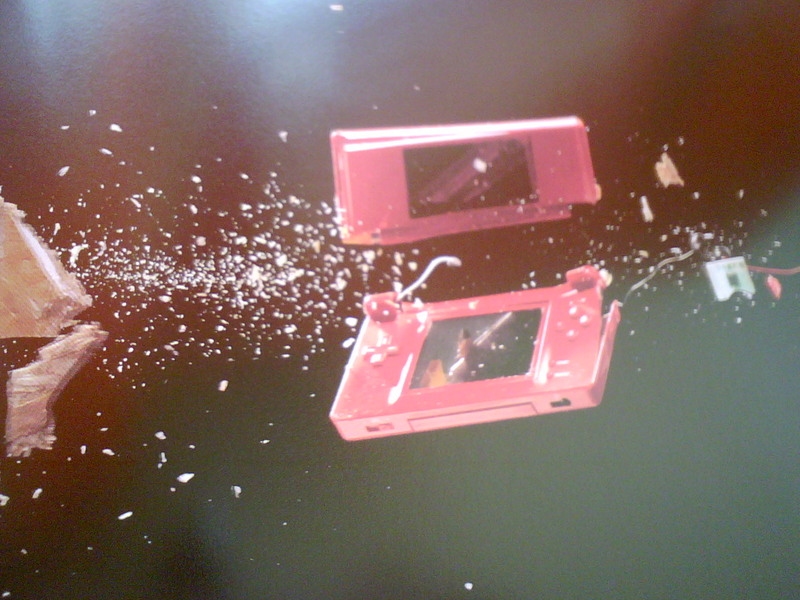 One of the best photo shoots of this volume, Overheating depicts several objects being thrown through a wall, namely the red DS Lite, in a visually pleasing manner. Another great visual feature, Dérapages, blends models with polygonal compositions to suggest everyday life accidents: on the picture, the suspended waiter accidentally drops the digital serving dish. Glitchography is a small but very interesting piece on the important role of the bug hunters and game testers in the development of each new game. Bugs come in different forms and shapes. 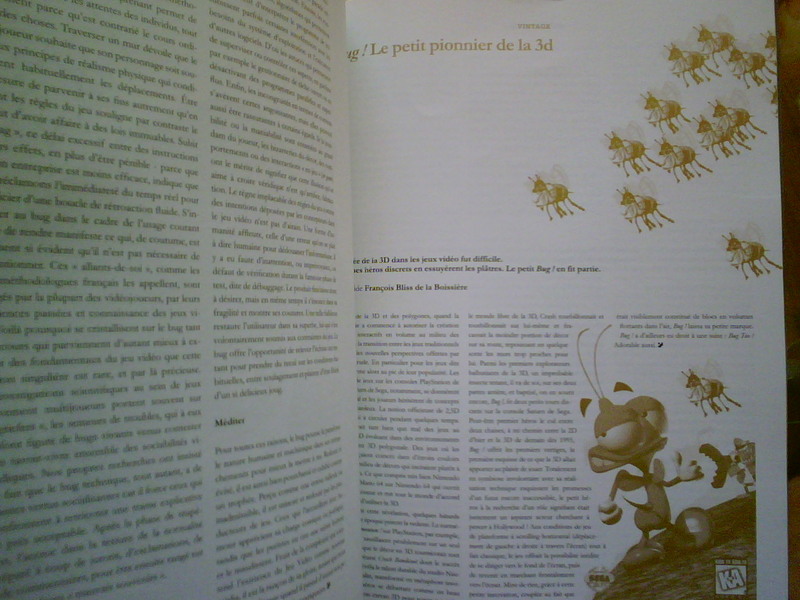 Léo Bourdin assumes the role of Bug Hunter and catalogues them in different classes from the Fatalist to the Pathologic according to their level of threat to the game experience. 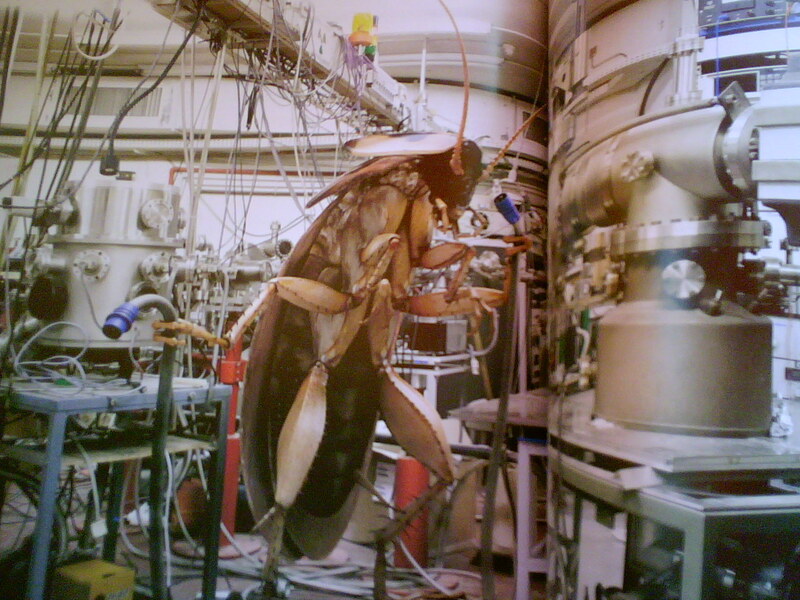 Bugs are a unique property of hardware and software systems. 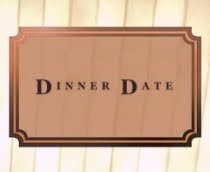 In Cinema, however, the absence of these errors is compensated by different occasions where fictional computers display abnormal behaviors that play an important role. Listed movies include famous computer gremlins from 2001 A Space Odyssey, Electric Dreams or Alphaville. 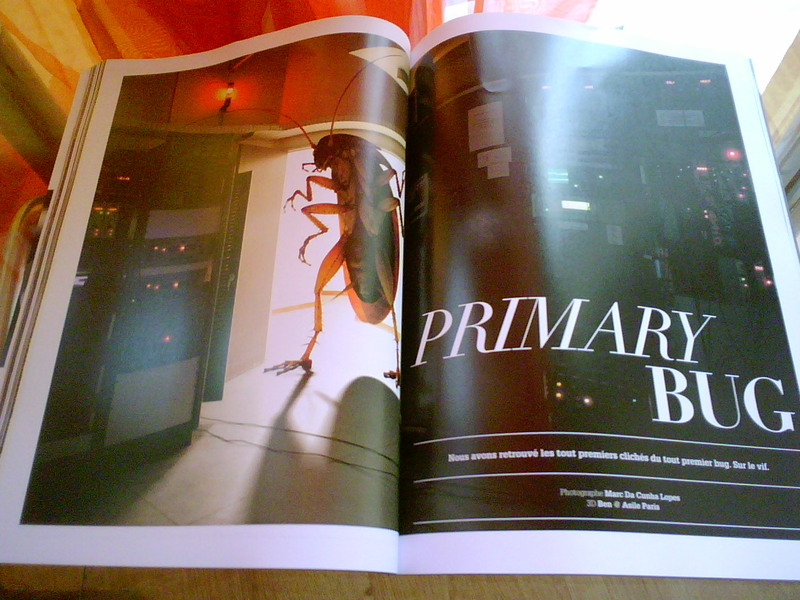 Reminiscent of the film District 9, this visual article combines the chaos of technology on the foreground with the superimposed CGI insects alluding to the original circumstances in which the computer term bug came to be. 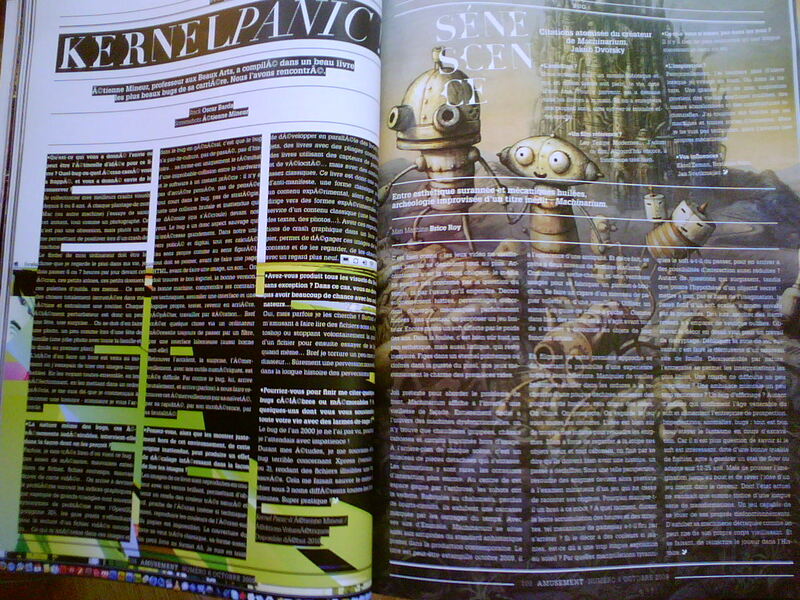 A one-page mention to the game MACHINARIUM, by Brice Roy, underlines the exquisite aesthetics of Jakub Dvorský's game. 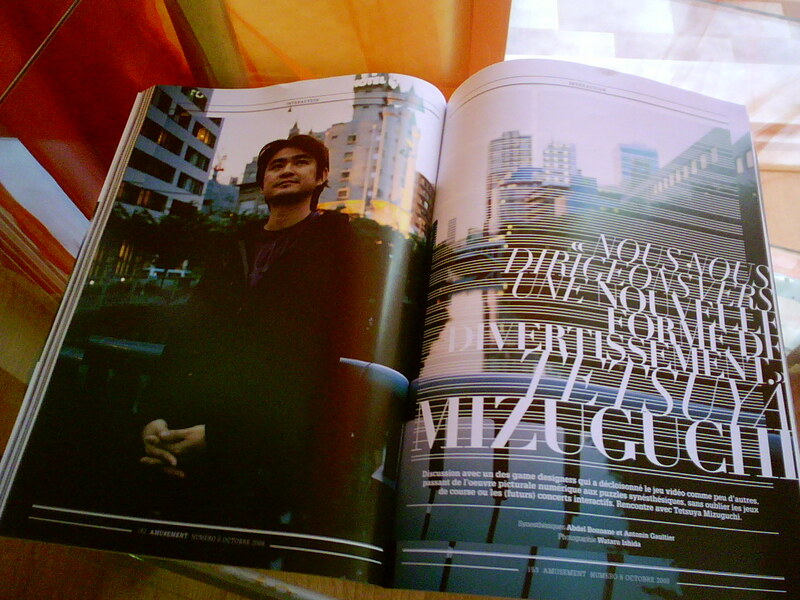 Possibly the most important article of this edition: a multi-paged interview with Tetsuya Mizuguchi in which he speaks openly about his early days at SEGA and the several experiences that motivated him to seek new grounds in game design when founding UGA or his recent studio Q? Entertainment. Like many other Japanese game designers often credited as being artists because of their exquisite work - including Ueda or Kojima - Mizuguchi speaks honestly about his definition of what videogames are. 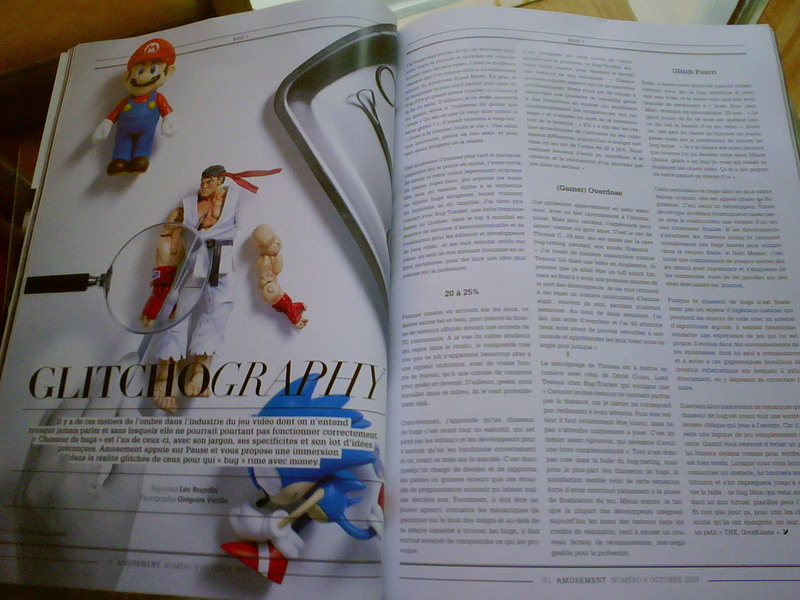 The page highlight reads: To me videogames aren't art, they're entertainment. 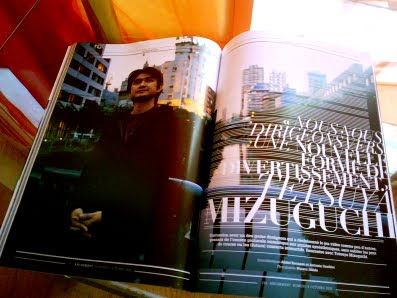 In his career, Mizuguchi has developed a mastery in blending audio and video. The inclusion of the concept of synaesthesia in his games, particularly REZ, originated in Paris when visited the Kandinsky painting gallery. The highlight reads: Everything will merge in the future: Videogames, Music, Cinema. 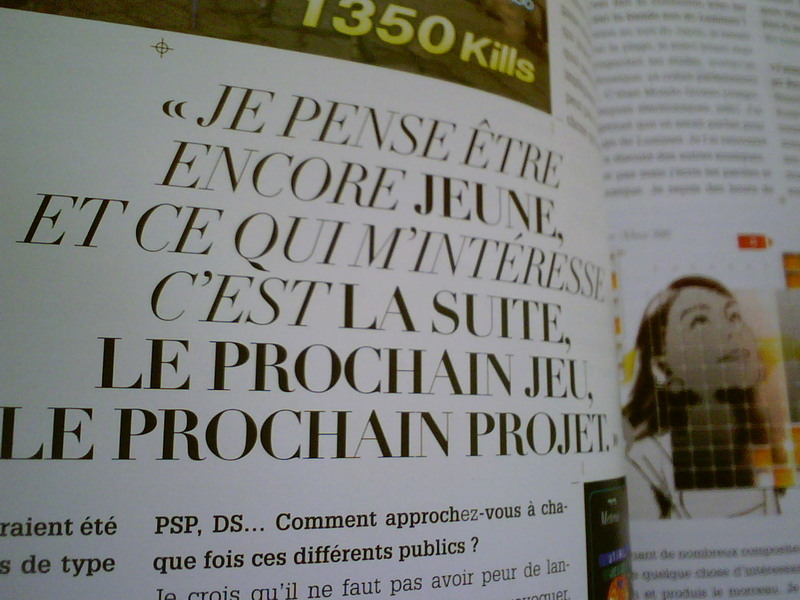 The author speaks openly about his ambitions: I see myself as still being young. And that which interests me is what comes next, the next day, the next project. 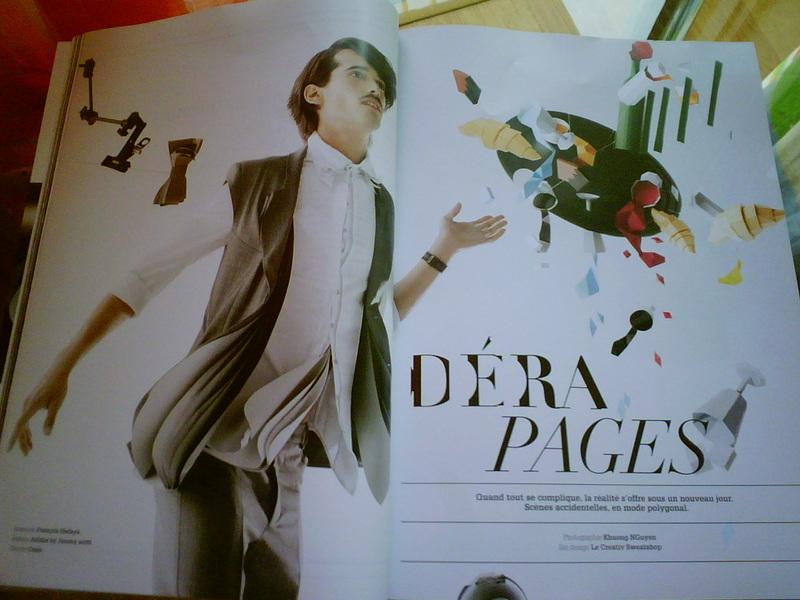 Surprisingly, the final pages are printed in a different kind of paper. One of them shows a very amusing article about an inevitable ludic reference, given this specific issue's main theme: BUG, the Sega Saturn game, is recognized here as one of the most important chapters in the history of 3D games. 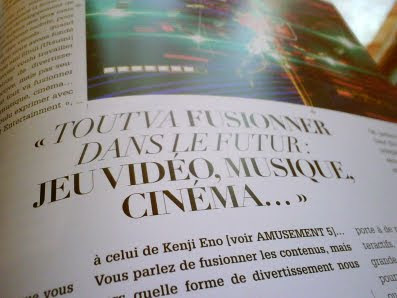 More information about this issue at the Amusement mag official site. It sounds like an interesting read but we're going to need an English translation version to see for ourselves.